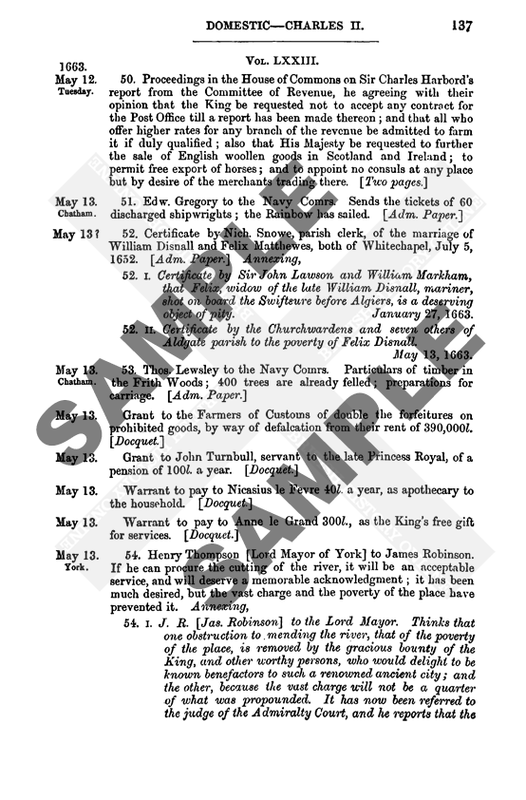 Calendar of State Papers Foreign: Elizabeth, Volume 3, 1560-1561. Originally published by Her Majesty's Stationery Office, London, 1865. H., James, see Hamilton, James. Hable de Grace, see Havre de Grace. Hableneuf, see Havre de Grace. Haddington, 188 note, 335 (3). -, the Prioress of the Cistertian nunnery of, 382 (8). Haliburton, James, Provost of Dundee, 479 note. -, John, of Murrayslaw, 807 (8). Hallhill, the Laird of, see Balnaves, Henry; Melville, Sir James. Hamas, , of Cherbourg, 609. Hamburg, 4, 20, 51 (4), 84 (5), 106 (1, 2), 138 (1, 2, 5), 165, 194 (4), 224 (7, 9), 236 (2), 252 (3), 263 (2), 536 (3), 616 (3), 631 (1), 655, 656, 827, 852 (1), 856, 884, 942 (10), 953. Hamilton, 371, 546 (1), 629 (2), 661, 662 (1, 2), 663, 752 (2), 968 (8). -, , 648 (3), 752 (2). -, Lord David, 409 (6), 411 (6), 460 (2), 470 (2), 472, 648 (3). -, Sir David, of Preston, 807 (5). -, Gawen, Abbot of Kilwinning, 70, 418 (2), 479 note. Hamilton, James, 598, 636 (2), 644 (1). -, -, Laird of Stenhouse, see Stenhouse. -, John, Archbishop of St. Andrew's, see St. Andrew's. -, Duke of, see Chtellerault, Duke of. Hamme, Hieronimus Van, Master of the accounts in Brabant, 658. Hampton, B., letter from, 140, 223. - Court, 576, 627 (2), 636 (2), 644 (1), 647, 702, 893. Handley, the Laird of, 792 (1). Hanse Towns, the, 33 (5), 96 (2), 196 (6), 216, 329, 390, 390 note, 536 (2, 4). Hans Frederic, see Saxony, Dukes in. Hapsburg, the Count of, 834 note. Harbottle, 604 (7), 686 (3). Harfleur, 233 (2), 254 (1). Harleston, Mr., late Captain of Ruisbank, 833 (7), 836 (9), 931. -, John, merchant of Edinburgh, 938. Harvey, Thomas, letters from, 973, 974. -, the monk, 17 (2), 867 (6), note. Hauton, the Laird of, 662 (1), 818 (3). Havre de Grace, 139 (2), 153 (1), 161 (1), 224 (3), 232 (3), 233 (1, 2), 241 (1), 244, 254 (1,), 255 (1, 5), 266 (3, 9, 19), 317 (1), 328 (2), 446 (2), 619 (13), 625 (1), 665 (5, 6), 668 (2), 716 (10, 30), 725 (1), 804 (1). Haworth, Sir George, see Howard. Hayes, Captain, 26 (2), 164 (1, 2). Heath, Nicolas, Archbishop of York, see York. Heidelberg, 119, 328 (2, 3, 4, 5, 6), 414 (2), 700, 781. Helsingborg, 579 (2), 852 (2). Henry VIII., King of England, see England. Hereswant, Chief Marshal of Sweden, 811 (6). Herries, Lord, see Maxwell, the Master of. Hertford, Edward Seymor, Lord, 819 (4), 874. Hesse, 21 (2), 119, 328 (3, 6), 416 (1), 736 (1), 843 (1), 852 (2). -, Philip, Landgrave of, letters from, 563. -, -, 21 (2), 33 (8), 52, 119, 149 (1) 173 (1, 2), 194 (9), 263 (5), 270 (1) 328 (3), 451, 615, 736 (1), 787 (2), 827, 843 (1). -, William, the young Landgrave of, 21 (2), 736 (1), 891 (21), 935 (1). Hickman, merchant of London, 968 (6). Ho, M. de', 233 (1). Hoffman, John, letter from, 903. Hogan, Robert, 224 (1), 241, 252 (4). -, Thomas, letter from, 47. Holland, 4, 15 (2), (51 (1), 84 (1, 2), 93 (2), 121 (2), 157, 161 (1), 174, 260, 852 (1), 942. Holloway, , an English pirate, 884. Holstein, Adolphus, Duke of, letters from, 443, 452, 545, 813, 813 note. -, -, letters to, 510, 539, 901. -, -, 16 (7), 26 (2), 35, 51 (3), 70, 85 (4), 96 (2), 117, 121 (2), 129, 216, 231, 249 (1), 270 (1), 414 (2), 454 (8), 508, 636 (2), 644 (1), 791 (3), 813 note, 891. -, Chancellor of, 129, 452 (2). Holy Island, 352, 520 (3), 521, 541, 582, 713, 714, 730, 856, 913, 956 (2), 1025. Holyrood, 101 (1), 172 (3), 218 (5), 409 (9). Home, Lord, see Hume, Lord. Honfleur, 241, 254 (1), 255 (3), 1018 (7). Horne, Robert, Bishop of Winchester, and Dean of Durham, see Winchester, Bishop of. Horton [Northumb. ], 735 (7), 740, 761. Hottomannus, Franciscus, letter from, 760. Houdan [Seine-et-Oise], 254 (3), 255 (1) 256, 257. Houseman, Giles, merchant of Antwerp, 51 (1), 93 (3). Howard, Sir George, letters from, 44, 46. -, -, 44 (2), 49 (6), 58 (1), 104 (2), 164 (1, 2, 3), 242 note, 269. -, William, Lord, of Effingham, 169 (3), 180, 238, 268, 324, 334 (3), 390 note, 502 (2), 673 (1). Hoye, the Count of, 414 (4). Hughes, Edward, letter from, 568. -, -, 567 (1), 571 (1), 608. Hull, 232 (3), 704 (2). Humby, Baron of, 382 (4). Hume, , 217, 623 note. -, Alexander, Lord, 1, 14 (1), 353, 458 (2), 619 (12), 735 (5), 792 (1), 818 (3), 957, 968 (2), 1039 (2). -, Patrick, 820 (2), 889. Humieres, M. de, see M. de Roquerolle. Hungary, 4, 383, 736 (2), 941 (4), 942. -, Ferdinand, King of, letters to, 74 note. -, -, 74 note, 236 (4). Hunsdon, Henry Carey, Earl of, letter from 327 note. -, -, 224 (7), 263 (6), 443, 539. -, -, Lady, 627 (3). -, -, daughter of, 627 (3). Huntly, George Gordon, Earl of, letter from, 258. -, -, letter to, 338. -, -, 12 (2), 14 (1, 2), 23, 26 (2), 94 (1), 100, 172 (1), 232 (3), 258, 371, 409 (1), 429 note, 454 (4), 501 (3), 550 (4, 5), 663, 711 (3), 818 (3), 968 (7), 1034 (2 4). Hurlston, , late Governor of Ruisbank, see Harleston. Hussey, Mr., the civilian, 84 (4). Hutson, John, of Pembridge, Hereford, 674. Hyland, John, of Dunkirk, 116 (3). Inchkeith, 89 (6), 94 (4), 124 (2), 133 (10), 206 (1), 210 (3), 239 (4), 242 (2), 280 (1), 281 (4), 311 (5), 312, 315 (3, 12), 323 (2), 387, 388, 550 (2), 737 (11), 744 (1), 759 (1), 789 (1), 861 (2), 1034 (2). Inch, Lucinet of the, see Lucinet. Indies, the, 22 (2), 648 (1), 725 (1), 842 (5). Ingleby, Captain, John 484 (4), 851 (4). -, Sir William, Treasurer of Berwick, letter from, 601. -, -, letters to, 402, 499, 549, 654, 747. -, -, 357, 369 (1), 436, 440 (1), 484 (6), 515, 521, 571 (1), 608, 612 (2), 715, 751, 769. Inglefield, Sir Francis, see Englefield. Innermeith, John, Lord, 371, 757. Innerwick, the Laird of, 382 (6). Invernaith, Lord, see Innermeith, John, Lord. Ireland, 26 (6), 68 (3), 162 (1), 192 (3), 261 (3), 315 (4, 6), 434 (7), 438, 454 (1), 716 (28), 745 (3), 784 (5), 818 (4), 832 (13), 931, 960. -, Deputy of, see Sussex. -, Lord Lieutenant of, see Sussex. Isemberg, the Count of, 414 (3). -, the Abb de 1, see Noailles, Gilles de. Isles, Lord of the, 70. Italy, 74 (3), 119, 120 (1), 128 (3), 191 (2), 223, 259, 328 (2), 349 (3), 370 (1), 373 (2), 386 (4), 390, 398, 494 (5), 495 (3), 496 (2), 619 (2), 694 (1), 716 (30), 782 (16), 783 (1), 815 (9), 822 (2), 894 (5), 942 (2, 4, 6, 7, 8, 10), 957, 1003.